Millionaire’s Row. It’s not exactly something you’d associate with a cemetery. But then again, neither are Atlantic City and Tacony. At least, you wouldn’t just by looking at one of the biggest mausoleums on Millionaire’s Row in Laurel Hill Cemetery. Laurel Hill Cemetery, located on 3822 Ridge Ave., is home to the mausoleum of the Disston family, among other famous elite families of Victorian Philadelphia. The cemetery features a special section, nicknamed Millionaire’s Row, for all of the most wealthy residents that it holds. It’s characterized by a row of mausoleums that lead down a curved road. Strolling through it, the history seems quite distant and sometimes hard to relate to. That is, until one tries. “Henry Disston had been an immigrant from England,” said Carol Yaster, the board president of Friends of Laurel Hill Cemetery. He came over with saw blades that were unbreakable. This led him to knock out most of his competition in Philadelphia. “The way he was selling his product was that he was going around to companies with a hammer and one of his saw blades. Then, he’d whack it with a hammer and break it. Then he would say, ‘Now watch mine.’ He would take the hammer and his wouldn’t break. So obviously his saw blade was superior,” Yaster explained. Disston has a bit of a sad story, though. His first wife died during childbirth. His life didn’t turn around much until he met his second wife, Mary. Described as “the richest and most influential woman in the 19th century of Northeast Philadelphia” by an old clipping shown by Yaster, Mary certainly knew what she was doing. “Any of these women who were married to men with money, you didn’t hear a lot about them. But that didn’t mean that they were dumb or doormats. These men wouldn’t marry a doormat or an idiot rather someone who could keep up the home front and be trusted with money,” Yaster explained. Together the couple saw his business expand. “As he got more money, he developed a community for his workers. It was called Tacony,” Yaster said. He had everything from homes to churches built, all the while making sure it was alcohol free. But what did the Disstons have to do with Atlantic City? “Everything,” Yaster noted. She explained that it had been Disston’s second wife, Mary, that put the city on the map. Mary had been from Leed’s Point, N.J. She had been described by Yaster as always having been in love with the ocean. So it didn’t take her long to make her husband fall in love with it as well. “They’d love to go with their children and stay all summer,” Yaster said. And that’s “when Mary got a bright idea,” Yaster continued. “She secretly built a house with the help of a cousin at Tenth and Indiana streets in Atlantic City. Now you have to figure that this is a Disston house. This isn’t a house. This is like a palace,” Yaster said. Once the house had been completed and the servants hired, Mary got her husband to come out to Atlantic City. “They picked him up at the train station and brought to his new house. And he loved it! He thought it was a great location. He loved Atlantic City so much that he built a lumberyard and a brickyard and he got his friends to invest in Atlantic City,” Yaster explained. 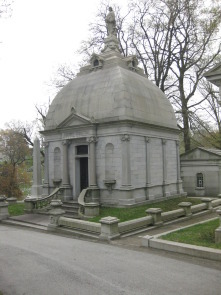 Another family that might be of interest for those visiting the Millionaire’s Row may be the Magee mausoleum. The Magee name has been used for a street name in Northeast Philadelphia, but it’s better known for its rehabilitation center that took years to build. The Magee family received all their money from investments in the railroad company, Yaster said. James Magee served as the president of the Pennsylvania Railroad until his death in 1878. “When he died and left his money to his children who all died, when his last daughter died she left the money for what was known as a convalescent hospital,” Yaster said. A convalescent home, as explained by Yaster, was a place for those who weren’t sick enough to stay in a hospital but couldn’t hire a nurse to take care of them. Anna Justina had left behind several million dollars to help found such a hospital. But by the time the courts had finished with the will and found the appropriate spot to build it, World War II broke out and there was no building. “Nothing was building in America except ships or tanks. Everything went to the war effort,” Yaster said. It wasn’t until after the war that they finally addressed the idea of the hospital. But times had changed, as Yaster pointed out. “What people did…was rehabilitate. You brought soldiers back from the war and you taught them how to live. If they had horrible injuries, you taught them how to live with their horrible injuries,” Yaster said. So it took a court battle to see if a rehabilitation hospital would be the same as the convalescent hospital that Anna Justina had in mind. “They decided that it was and they then went in search of a place to build a hospital. Magee Rehabilitation Hospital opened in the mid-1950s,” Yaster noted. “That’s where that money came from,” she added. Magee Rehabilitation is still open and continues to serve as a expanded rehabilitation center for new amputees to even those with spinal cord injuries. The stories of the Magee and Disston families show that Laurel Hill’s past doesn’t just stop dead at its gates.